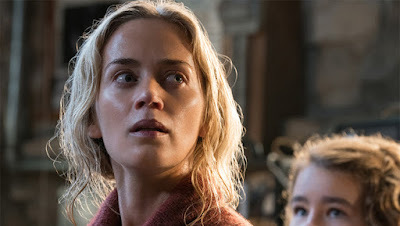 Emily Blunt has a lot going on already, with Jungle Cruise just wrapping up and A Quiet Place 2 in the works, but she's found room to add another film to her slate, one that has her husband John Krasinski attached. Deadline reports Blunt is in talks to star in Annapurna's Not Fade Away, an adaptation that has Krasinski and David O. Russell on board as producers. The film shouldn't be confused with David Chase's 2012 drama of the same name. Blunt would be starring in an adaptation of Rebecca Alexander's 2015 memoir on how she was "born with a rare genetic mutation that caused her to lose her sight and hearing over time, beat the odds and expectations of her prognosis." Lindsey Ferrentino is writing the script, but at this point there's no plan for Russell or Krasinsky to direct. We'll see if that holds true as the project develops. Russell hasn't directed anything since 2015's underwhelming Joy, while Krasinski is coming off the massive success of A Quiet Place.